Breast cancer is prone to metastasize to bone. Once metastatic cells are in the bone marrow, they do not, on their own, destroy bone. Instead, they alter the functions of bone-resorbing (osteoclasts) and bone-forming cells (osteoblasts), resulting in skeletal complications that cause pathological fractures and pain. In this review, we describe promising molecular bone-targeted therapies that have arisen from recent advances in our understanding of the pathogenesis of breast cancer bone metastases. These therapies target osteoclasts (receptor activator of nuclear factor kB ligand, integrin αvβ3, c-Src, cathepsin K), osteoblasts (dickkopf-1, activin A, endothelin A) and the bone marrow microenvironment (transforming growth factor β, bone morphogenetic proteins, chemokine CXCL-12 and its receptor CXCR4). The clinical exploitation of these bone-targeted agents will provide oncologists with novel therapeutic strategies for the treatment of skeletal lesions in breast cancer. Around 350,000 new breast cancer cases are detected in Europe every year. Because of the progress made in the treatment of this cancer, mortality in patients is now increasingly linked to the occurrence of distant meta-stases. Certain organs are favored sites for circulating cancer cells to develop metastases, and this can only arise through a permissive microenvironment in the target tissue that facilitates tumor growth . In this respect, breast cancer is prone to metastasize to bone: around 70 to 80% of patients with advanced disease exhibit bone metastases . These skeletal lesions can be fatal or may rapidly impede the quality of life of patients by causing pathological fractures, hypercalcemia, nerve compression and loss of mobility . Most of these patients will also experience substantial, life-altering cancer-induced bone pain. 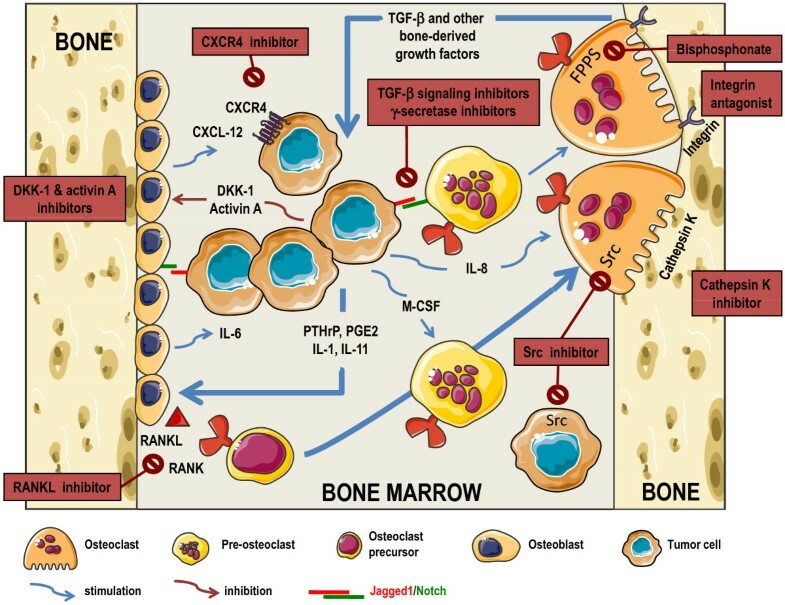 There is therefore a need to better understand molecular mechanisms associated with cancer-induced bone diseases in order to improve existing therapies and/or develop new targeted therapies. Here, I provide an overview of current research and insights into the cellular and molecular events that mediate bone metastasis formation and discuss the evidence that some of these events could stand as therapeutic targets to treat skeletal lesions in breast cancer. Once metastatic breast cancer cells are in the bone marrow, they do not, on their own, destroy bone. Instead, they alter the functions of bone-resorbing (osteoclasts) and bone-forming cells (osteoblasts) and hijack signals coming from the bone matrix, thereby disrupting physiological bone remodeling [2, 3]. Indeed, there is a 'vicious cycle' whereby metastatic cells residing in the bone marrow secrete factors that stimulate osteoclast- mediated bone resorption and growth factors released from resorbed bone stimulate tumor growth . Breast cancer cells may also interact stimulation of osteoclast differentiation and maturation . Furthermore, breast cancer cells secrete factors that inhibit osteoblast differentiation and activity [2, 3]. Their interaction with osteoblasts also induces the release of cytokines that promote tumor growth . Taken together, this leads to an imbalance between bone resorption and bone formation, resulting in enhanced skeletal destruction and, as a consequence of osteolysis, occurrence of pathological fractures (Figure 1). In bone, breast cancer cells secrete different factors that stimulate osteoclast differentiation and maturation through the activation of the RANKL/RANK or the Jagged1/Notch signaling pathways. Then, integrin, Src and cathepsin K play an essential role in the bone-resorbing activity of mature osteoclasts. In addition, breast cancer cells secrete components (DKK-1, activin A) that inhibit osteoblast differentiation. This leads to enhanced bone destruction and, as a consequence, to the release of bone derived-factors (TGF-β) that stimulate tumor growth. Moreover, CXCL-12 produced by osteoblasts promotes the recruitment and survival of CXCR4-expressing breast cancer cells. There is therefore a 'vicious cycle' (depicted by the large blue arrows) whereby metastatic cells stimulate osteoclast-mediated bone resorption and growth factors released from resorbed bone stimulate tumor growth. Red boxes highlight components that are attractive therapeutic targets, some of which are in clinical development. The drawings were produced using Servier Medical Art . Abbreviations: CXCL-12, C-X-C motif chemokine 12; CXCR4, C-X-C chemokine receptor type 4; DKK-1, dickkopf-1; FPPS, farnesyl pyrophosphate synthase; IL, interleukin; M-CSF, macrophage-colony stimulating factor; PGE2, prostaglandin E2; PTHrP, parathyroid hormone-related peptide; RANK, receptor activator of nuclear factor kB; RANKL, RANK ligand; Src, proto-oncogene tyrosine-protein kinase; TGF-β, transforming growth factor-β. Several molecules that are produced by breast cancer cells - for example, parathyroid hormone-related protein, interleukins (IL-6, IL-8, and IL-11), cytokines (macrophage colony stimulating factor (M-CSF)) and prostaglandins - stimulate osteoclast activity through the activation of the receptor activator of nuclear factor-kB ligand (RANKL)/RANK pathway, which is the primary mediator of osteoclast-mediated bone resorption [3, 5]. Breast cancer cells may also directly stimulate osteoclast-mediated bone resorption by interacting with preosteoclasts through the Jagged1-Notch pathway . In addition, breast cancer cells secrete activin A (a member of the transforming growth factor (TGF)-β superfamily of growth factors), noggin (a bone morphogenetic protein (BMP) antagonist) and dickkopf-1 (DKK-1; a Wingless/int (Wnt) protein antagonist), all of them inhibiting osteoblast differentiation [3, 6]. As bone is resorbed, growth factors (for example, TGF-β and insulin-like growth factor-I) stored in the bone matrix are then liberated and stimulate breast cancer cell proliferation, providing a supportive niche for tumor growth (Figure 1). The realization that normal cells in the bone microenvironment support the development of skeletal lesions has led to the use of bisphosphonates, as inhibitors of osteoclast-mediated bone resorption, in the treatment of patients with bone metastases . Nitrogen-containing bisphosphonates specifically inhibit osteoclast farnesyl pyrophosphate synthase activity, a key enzyme in the mevalonate pathway, which causes the inhibition of prenylation of small GTPases and the subsequent inactivation of osteoclasts. In addition to inhibition of osteoclast activation and function, a growing body of preclinical evidence indicates that these nitrogencontaining bisphosphonates exert direct and/or indirect antitumor effects. These antiresorptive and antitumor effects of bisphosphonates have been recently reviewed  and, therefore, will not be discussed here. The following is a review of factors that are promising molecular bone-targeted therapies or will be likely targets for future therapeutic intervention to restore bone remodeling and suppress tumor growth. Factors that promote osteoclast formation (RANK/RANKL), activation (integrin, c-Src) and function (cathepsin K) represent promising therapeutic targets for inhibition of pathological bone resorption. RANKL, RANK and osteoprotegerin (OPG) are key regulators of osteoclast-mediated bone resorption . RANKL is a transmembrane protein expressed on the surface of osteoblasts that can be cleaved as a soluble form by proteases . Both the membrane-bound and soluble forms of RANKL attach to RANK, a receptor on the cell surface of osteoclast precursors, to stimulate osteoclastogenesis . Conversely, OPG is a soluble RANKL inhibitor produced by osteoblasts that inhibits RANKL/RANK interaction . Hence, the balance between RANKL and OPG regulates the process of bone resorption, and the disruption of this balance is observed in many cancers, including breast cancer . There is a growing body of evidence that RANK/RANKL plays a critical role in the expansion of tumor cells in bone [3, 8]. As a consequence, OPG is capable of inhibiting bone destruction and reducing skeletal tumor burden in animal models of breast cancer bone metastasis [3, 8]. This reduction in tumor burden is likely related to OPG inhibition of osteoclast-mediated bone resorption because OPG does not affect tumor growth in soft tissues . However, tumor-derived matrix metallo-proteinase (MMP)-7 and membrane type 1 matrix metallo-proteinase (MT1-MMP) both function as sheddases that release RANKL confined on the osteoblast surface, and the resulting soluble form of RANKL can stimulate the migration of RANK-expressing breast cancer cells in a manner that is inhibited by OPG [5, 8, 9]. Moreover, RANK and RANKL are expressed in the normal mammary epithelium of mouse mammary tumor virus (MMTV)-neu transgenic mice, a spontaneous mammary tumor model, and the selective pharmacological inhibition of RANKL with RANK-Fc reduces mammary tumor development in these transgenic mice . Denosumab, a fully human monoclonal antibody directed against RANKL, is currently in clinical development for use in postmenopausal osteoporosis and cancer-induced bone diseases, including metastatic breast cancer (Table 1) . Denosumab is superior to bisphosphonate zoledronate in delaying time to first and subsequent skeletal-related events in breast cancer patients with bone metastases, demonstrating its potency as an antiresorptive agent . However, no difference in overall survival is observed between patients treated with denosumab or zoledronate . Importantly, denosumab induced an 86% tumor response rate in patients with giant cell tumor of bone; this type of tumor consists of RANK-expressing osteoclast-like giant cells and mononuclear (stromal) cells that express RANKL . Considering the potential role of RANKL on RANK-expressing breast cancer cells in preclinical models, it will be interesting to know whether denosumab could exhibit antitumor effects in the clinical setting. In this respect, denosumab is being assessed in two large phase III clinical trials examining prevention of bone loss in women with early breast cancer (Table 1). These clinical trials will be helpful to determine whether denosumab has any antitumor properties. aCXCR4, C-X-C chemokine receptor type 4; RANKL, receptor activator of nuclear factor-kB ligand; c-Src, proto-oncogene non-receptor tyrosine kinase. bData obtained from ClinicalTrials.gov . Integrins are a family of cell surface receptors that primarily mediate interactions of cells with components of the extracellular matrix. They form heterodimeric transmembrane receptors consisting of noncovalently associated α and β subunits. Although osteoclasts express various integrins, it is now well accepted that avb3 integrin is a central molecule for osteoclast function . It mediates the capacity of the cell to polarize, spread, form an actin ring (which surrounds the ruffled border), and degrade bone. Upon integrin activation, αvβ3 stimulates an intracellular signaling complex consisting of tyrosine kinases c-Src and Syk . The importance of αvβ3, c-Src and Syk in osteoclast activity is revealed by the knock-out of each of these genes in mice, which leads to the development of osteopetrosis because of the lack of bone resorption . Thus, αvβ3, c-Src and Syk represent an essential signaling complex in the boneresorbing osteoclast, and each member of this complex is a candidate therapeutic target. There is preclinical evidence that αvβ3 integrin-targeting drugs, including peptides (S247, ATN-161, cilengitide) and nonpeptidic small molecules (PSK1404), successfully block osteolysis and tumor growth in animal models of bone metastasis [14, 15]. Not only are these αvβ3 antagonists inhibitory for osteoclast-mediated bone resorption, but we have shown that PSK1404 prevents bone colonization by αvβ3-expressing human breast cancer cells when using a dosing regimen that did not inhibit bone resorption . Thus, therapeutics targeting αvβ3 would be particularly promising for the treatment of advanced cancers associated with skeletal lesions because these drugs could inhibit bone metastasis formation in at least two ways: by inhibiting osteoclast-mediated bone resorption and by directly targeting cancer cells. There are several ongoing clinical trials evaluating the anticancer effect of integrin antagonists in advanced refractory and metastatic cancers [14, 16]. Only a few integrin antagonists are being evaluated in breast cancer patients with bone metastasis (Table 1). In this context, Galapagos announced (December 2010), based on good safety results in healthy volunteers, that it plans to initiate a phase I clinical trial in cancer patients with the integrin antagonist GLPG0187 (an antagonist developed on the basis of experimental findings obtained with PSK1404 ). Another drug in clinical trials, ATN-161 (developed by Attenuon), is a non-RGD peptide derived from the synergy region of fibronectin that binds to αvβ3 and α5β1 and blocks tumor growth and bone metastasis in animals . ATN-161 is being tested in a phase I trial in patients with advanced solid tumors . Similarly, IMGN388 (developed by ImmunoGen, Inc.) is a human IgG1 anti- αv integrin antibody conjugated to the maytansinoid DM4 that is being tested in patients with advanced solid tumors, including metastatic breast carcinoma (Table 1). Cilengitide (developed by Merck), a RGD-mimetic cyclic peptide inhibitor of both αvβ3 and αvβ5 integrins, inhibits bone metastasis in animals , and is currently being tested in patients with glioblastoma and advanced solid tumors, including breast cancer (Table 1) . Finally, L-000845704 (developed by Merck), an αvβ3 integrin nonpeptide antagonist, inhibits bone resorption in women with postmenopausal osteoporosis . It would be interesting to examine the effect of this agent in clinical oncology. c-Src belongs to a family of non-receptor tyrosine kinases implicated in controlling signal transduction downstream of a variety of cell surface receptors, including integrins, E-cadherin and tyrosine kinase receptors . It is also activated in response to RANKL/RANK interaction in osteoclasts after the recruitment of TRAF6 (tumor necrosis factor receptor-associated factor 6) to the intracellular domain of RANK to mediate downstream signaling . Therefore, c-Src has a central role in osteoclast function. In experimental bone metastasis, the injection of cancer cells in Src null mice shows that these animals are protected from tumor-associated bone destruction because Src-defective osteoclasts do not resorb bone . In addition, high activation of c-Src frequently occurs in cancer cells and the overexpression of a dominant negative form of Src in human MDA-MB-231 breast cancer cells decreases their tumorigenicity and their ability to induce lung and bone metastases in animals [20, 21]. Indeed, Src is critical for the survival and outgrowth of breast cancer cells in the bone marrow. Src mediates AKT regulation and cancer cell survival responses to CXCL12 and TRAIL (tumor necrosis factorrelated apoptosis-inducing ligand), two factors that are distinctively expressed in the bone metastasis micro- environment . Preclinical studies also showed that c-Src inhibitors (CGP76030, AP23451, dasatinib) successfully inhibited MDA-MB-231 breast cancer invasion, growth and bone metastasis formation in animals [18, 21, 22]. Thus, c-Src in osteoclasts and cancer cells could be a therapeutic target in the clinic. Several pharmaceutical companies have now advanced Src inhibitors as potential therapeutic agents for use in bone-related diseases associated with breast cancer (Table 1). For example, saracatinib (AZD0530; Astra-Zeneca), a dual inhibitor of Src/Abl, has been shown to decrease levels of bone resorption markers in a phase I study in patients with solid tumors . Phase II studies are ongoing to evaluate saracatinib effects in patients with breast cancer and (bone) metastases (Table 1). Similarly, the efficacy of dasatinib (an inhibitor of multiple tyrosine kinases; Bristol-Myers Squibb), alone or in combination with bisphosphonate zoledronate, is being tested in patients with breast cancer and bone metastases (Table 1). Bosutinib (developed by Pfizer) is another dual inhibitor of Src/Abl that is in clinical development . However, there are no clinical studies in metastatic bone disease with this drug to date. Cathepsin K is a lysosomal cysteine protease highly expressed in osteoclasts that plays a major role in bone resorption [3, 25]. Bone resorption can be viewed as a sequential process where the secretion of protons by osteoclasts induces the dissolution of the mineral phase and provides an optimal acidic microenvironment for the subsequent proteolytic activity of osteoclast-derived cathepsin K, enabling degradation of the demineralized collagenous matrix . The function of cathepsin K in osteoclasts was first revealed by the finding of a loss-of-function mutation in the human cathepsin K gene in patients with pycnodysostosis, a rare genetic disorder characterized by impaired osteoclastic bone resorption . Moreover, such a pycnodysostosic phenotype can be reproduced in mice in which cathepsin K has been genetically ablated . Conversely, overexpression of cathepsin K in mice results in increased bone degradation . Overall, these findings indicate that cathepsin K plays a key role in osteoclast-mediated bone resorption. Soon after the discovery that cathepsin K was a major cysteine protease in osteoclasts, it was postulated that molecules that inhibit cathepsin K activity could serve as useful therapeutic agents against diseases associated with excessive levels of bone destruction. Moreover, cathepsin K inhibitors not only inhibit bone resorption but also stimulate bone formation . It has been suggested that cathepsin K inhibitors might prevent degradation of bone-derived growth factors, allowing their release from the bone matrix as biologically active molecules that could then stimulate bone formation . Thus, by facilitating bone formation, cathepsin K inhibitors seem to have an advantage over other antiresorptive agents in the treatment of diseases associated with bone loss. Pre-clinical data have shown that the cathepsin K inhibitor AFG-495 reduced bone destruction and skeletal tumor burden in animal models of breast cancer bone metastasis . Although breast cancer cells that metastasize to bone express cathepsin K [3, 27], this reduction of skeletal tumor burden is most probably due to the antiresorptive activity of AFG-495 which, in turn, deprives breast cancer cells of bone-derived growth factors that are required for tumor growth. This assumption was supported by the observation that AFG-495 therapy did not inhibit subcutaneous growth of breast tumor xenografts at a dosing regimen that did inhibit skeletal tumor burden in animals . Thus, cathepsin K inhibitors render the bone a less favorable microenvironment for tumor growth by inhibiting osteoclast-mediated bone resorption. Cathepsin K inhibitors may have some shortcomings . For instance, the basic nitrogen-containing cathepsin K inhibitor balicatib (AAE-581, Novartis) accumulates within acidic subcellular organelles such as lysosomes. These lysosomotropic properties of balicatib result in the inhibition of the activity of other cysteine cathepsins present in lysosomes, which may cause adverse effects in patients. For example, it has been reported in a 12-month phase III trial that a small number of patients experienced skin adverse effects during balicatib therapy, which led to the withdrawal of the inhibitor from human osteoporosis clinical trials . This off-target inhibitory activity does not occur with odanacatib (MK-0822, Merck), which is a promising compound under investigation in clinical trials for osteoporosis therapy. Clinical trials of cathepsin K inhibitors in oncology are limited to date (Table 1). A phase II trial in women with breast cancer and bone metastases shows that odanacatib successfully reduces bone resorption markers after 4 weeks of treatment . The realization that osteolytic lesions resulted not only from enhanced osteoclast-mediated bone resorption but also from inhibition of bone formation led to the development of therapeutic strategies aimed at restoring osteoblast function. The Wnt signaling pathway plays a key role in osteoblastogenesis. Wnt proteins bind Frizzled receptor family members and, in association with low-density lipoprotein receptor-related protein (LRP)5/6, trigger downstream signaling via β-catenin, which induces activation of different genes involved in osteoblastogenesis . DKK-1 binds to LRP5/6 and blocks the interaction with Wnt-1, resulting in b-catenin degradation and inhibition of osteoblast differentiation . Elevated levels of DKK-1 were first described in the serum and bone marrow of patients with multiple myeloma . The blockade of DKK-1 using neutralizing antibodies resulted in a decrease of both osteolysis and skeletal tumor growth in a severe combined immunodeficiency (SCID)-hu murine model of multiple myeloma [31, 32]. Moreover, DKK-1 antibody treatment led to a significant increase in osteoblast number, serum human osteocalcin level, and trabecular bone, indicating that this antibody had bone anabolic effects [31, 32]. A clinical trial combining the DKK1-neutralizing antibody BHQ880 (Novartis) and zoledronate in relapsed/refractory myeloma patients is currently ongoing (NCT00741377). By contrast, there have been no clinical trials of BHQ880 in breast cancer to date. Nevertheless, there is some preclinical and clinical evidence that DKK-1 is secreted by breast cancer cells that metastasize to bone . In addition, breast cancer-derived DKK1 inhibits osteoblastogenesis . Further studies are therefore required to examine the importance of DKK-1 as a therapeutic target for breast cancer bone metastasis. Sclerostin is another Wnt inhibitor produced by osteocytes . Sclerostin-neutralizing antibodies have been developed to inhibit the binding of sclerostin to the LRP5 receptor . Clinical findings demonstrate a strong anabolic effect of sclerostin antibody treatment in osteoporotic patients . There is no evidence for a role of sclerostin in experimental bone metastasis. Additionally, no clinical trials using the sclerostin antibody in cancer-induced bone diseases have been initiated so far. Activin A is a member of the TGF-β superfamily of growth factors that is widely distributed in different cells and tissues . The biological effects of activin A are mediated by two transmembrane serine/threonine kinase receptors. Activin A binds to Act RII type-II receptor (or Act RIIA), which leads to the recruitment, phosphorylation and activation of ActRIB or activin-like kinase (ALK)4 type I receptors . This activation of type I receptors then phosphorylates the receptor-regulated Smad (R-Smad) proteins Smad2 and Smad3, which enter the cell nucleus together with the common-Smad (Co-Smad), Smad4, resulting in regulation of gene transcription in bone cells . In bone metastasis, activin A produced by tumor cells acts as a stimulator of bone degradation, inhibiting osteoblast differentiation and stimulating osteoclast differentiation . Interestingly, circulating levels of activin A in the serum of breast or prostate cancer patients with bone metastases are significantly higher than those of patients without bone metastases . Therefore, this cytokine may be considered as a potential target for a more selective therapeutic approach in the treatment of skeletal metastasis. For example, different groups have recently used a soluble form of the extracellular domain of Act RIIA receptor fused to the Fc fragment of a murine IgG (RAP-011) to show that it stimulates bone formation and blocks the formation of osteolytic lesions in animal models of myeloma and breast cancer [37, 38]. A phase- IIa, multiple-dose study is currently evaluating the safety, tolerability and efficacy of the human analog of RAP-011, namely ACE-011 (Celgene Corporation), in patients with osteolytic lesions of multiple myeloma (n = 30) (NCT00747123). There are no ongoing clinical trials in breast cancer. The endothelins comprise a family of three small (21 amino acid) peptides: ET-1, ET-2 and ET-3 . They exert their effects by binding to the cell surface receptors ETA and ETB . Endothelins are produced by different cell types, including breast and prostate carcinoma cells . In bone, tumor-derived ET-1 stimulates mitogenesis in osteoblasts, which express both ETA and ETB, and it decreases osteoclast activity and motility . ET-1 is therefore involved in the formation of osteoblastic lesions that are frequently observed in patients with metastatic prostate cancer and, to a lesser extent, in metastatic breast cancer. For example, human ZR-75-1 breast cancer cells cause osteoblastic bone metastases in animals that are inhibited by ETA antagonist ABT-627 (atrasentan) . The mixed (ETA and ETB) inhibitor bosentan also inhibits murine 4T1 breast cancer bone metastases in vivo . Furthermore, ET-1 and ET-2 increase breast cancer cell migration and invasion in vitro . There is therefore a rationale in studying the effect of endothelin antagonists in breast cancer patients with bone metastases. However, no clinical trials in breast cancer have been conducted so far. In prostate cancer, clinical trials with atrasentan have been inconclusive . Several clinical trials with zibotentan, a more selective inhibitor of ETA, in prostate cancer are currently ongoing. However, two of these trials have recently been stopped because of a lack of benefit as of 7 February 2011 . TGF-β binds to a heteromeric complex of transmembrane serine/threonine kinases, the type I and type II receptors ALK5 and TβRII, which phosphorylate and activate the TGF-β-specific intracellular signaling mediators Smad2 and Smad3. The phosphorylated Smad2/3 complex then binds Smad4 and translocates to the nucleus, where it regulates the transcription of TGF-β target genes . In skeletal tissue, TGF-β is a major bone-derived growth factor responsible for driving growth of several solid tumors, including breast cancer. It regulates the expression of many factors (integrin αvβ3, IL-6, IL-8, IL-11, MMP-1, CXCR-4, and so on) that are involved in bone metastasis formation . Thus, the blockade of TGF-β signaling offers a target for therapeutic intervention to decrease bone metastases. Several strategies designed to inhibit TGF-β signaling - such as dominant negative TβRII, small molecule inhibitors of TβRI, antisense oligonucleotides and neutralizing TGF-β antibodies - have been used to block experimental breast cancer bone metastases [45–47]. However, to date, there have been no clinical trials studying the effect of a TGF-β-related therapy for breast cancer with bone metastases, although TGF-β inhibitors have been investigated for other types of cancers. Details of these TGF-β inhibitors in ongoing clinical trials have been recently reviewed . By signaling through the Smad pathway, TGF-β is also an effector of epithelial-to-mesenchymal transition (EMT), a process known to facilitate cancer progression and metastasis . Interestingly, exogenous BMP-7, a member of the TGF-β superfamily, antagonizes TGF-β signaling and reduces EMT in breast and prostate cancer cells, which leads to the inhibition of bone metastasis formation in animals [49, 50]. In a similar vein, the Jagged1-Notch pathway in breast cancer cells is strongly upregulated by TGF-β and the pharmacological disruption of the Notch signaling pathway by the γ-secretase inhibitor MRK-003 blocks breast cancer bone metastasis formation in animals . Notch stimulates EMT . We could therefore envision that targeting the TGF-β-depen- dent EMT pathway with BMP-7 or γ-secretase inhibitors could be an alternative strategy to fight bone metastases. Chemokines can be secreted by virtually all types of cells. Most of the chemokines are up-regulated in the presence of pro-inflammatory signals and are involved in both adaptive and innate immune responses, whereas a few, such as CXCL-12, are constitutively expressed and are important for normal cellular trafficking . In bone, CXCL-12 is produced by multiple bone marrow cell types, including osteoblasts. Chemokines work by binding to specific G-protein-coupled receptors on plasma membranes of target cells. There is now ample evidence that chemokines and their receptors play a key role in organ-specific cancer metastasis . In this respect, several chemokine receptors (CXCR3, CXCR4, CCR4, CCR5, and CCR7) expressed by breast cancer cells are associated with metastases, among which CXCR4 seems to be a major metastasis-regulator receptor . CXCR4 controls the metastatic destination of breast cancer cells in organs (lung, liver, and bone) where its ligand, the chemokine CXCL-12, is produced in high quantity . Moreover, CXCL-12 is not only implicated in the homing of breast cancer cells in the bone marrow, but also in their survival . CXCL-12, by binding to CXCR4, activates the nonreceptor tyrosine kinase Src, which, in turn, stimulates the AKT cell survival pathway in breast cancer cells residing in the bone marrow . Thus, the CXCL-12/CXCR-4 axis seems to be an attractive therapeutic target to treat bone metastases. Consistent with this, the blockade of CXCR4 using antibodies or a synthetic peptidic antagonist (CTCE-9908) reduces the formation of experimental lung and bone metastases caused by CXCR4-expressing breast cancer cells [52, 53]. Data from clinical trials are, however, scant. A phase I/II clinical trial has determined the tolerability and safety profile of repeated administration of CTCE-9908 in patients (n = 25) with advanced metastatic disease who stopped responding to standard treatments or for whom no curative therapy exists. The clinical response was modest (6 patients out of 20 (30%) had overall stable disease) and the tolerability was good . However, caution should be used in designing trials to evaluate the utility of blockade of the CXCL-12/CXCR-4 axis. Preclinical data indicate that disruption of CXCR4 may enhance osteoclastic bone resorption, thus making the bone an even more favorable site for growth of tumor cells . As such there is theoretical concern that treatment of patients with CXCR4 inhibitors could lead to increased bone turnover causing both detrimental effects on bone health as well as increased tumor burden in bone. Findings presented in this review highlight several molecular components acting at early and late stages during the development and progression of breast cancer bone metastases (Figure 1). These components stand as attractive new targets for cancer therapeutics. They could be used in combination with bisphosphonates to efficiently block the development of skeletal lesions in women with breast cancer. This article is part of a review series on Bisphosphonates and other bone-targeted agents in breast cancer, edited by Janine Mansi and Robert Coleman. Other articles in the series can be found online at http://breast-cancer-research.com/series/bisphosphonates.